In our last chapter, we see a mother who is giving wise instructions to her son, advising him to avoid loose women and intoxicating drink, for both have the power to destroy. She also reminds him of the importance of speaking out for the weak, poor, and needy, as well as learning to judge righteously. Oh, if only our nation’s leaders would learn to judge righteously! She goes on to teach him about a virtuous woman. When I was a stay-at-home mom, I wrote an entire series on the Proverbs 31 woman. Please click that category on my sidebar for more information on that topic. After the economic collapse in 2008, I needed to enter the workforce once again. I want to address some new insights I have discovered when I look at this topic from that perspective. Her worth is far above rubies. To her husband, she is priceless. The best way I can be priceless to my husband and my daughter is to be in the Word. I’m not kidding when I say this! These aren’t just words I am saying to sound spiritual. I know me. I have seen the me that I am when I read the Word as just another thing to mark off my to-do list. I have seen the me that I am when I am desperate for the Lord, viewing His Word as a precious treasure. There is a big difference in my attitude, as well as how I act, talk, think, and respond. One week, I didn’t devote as much time to reading the Word. I began to notice that my spirit wasn’t as peaceful and joyful as it had been in previous weeks. While I wasn’t sinning in my thoughts, words, or actions, I just felt ‘off’ spiritually, and I didn’t like it. As soon as I was done with the task at hand, I sat down with my Bible, and spent precious time in God’s Word. It felt so good! We see the heart of her husband safely trusts her. My job requires that I work with men and women. You can’t work in a large organization and not hear the stories of who is cheating with who. I have seen looks, and heard comments, from male coworkers that make me uncomfortable. What am I to do? First, I make a point of avoiding those people as much as possible. If that isn’t possible, I can try to put up barriers where they can’t touch me. I can also speak of highly of my husband, talk about the Lord, or even ask them how their family is doing. That can diffuse ill intentions quickly. We see she rises while it is yet night, providing for her family. My job requires that I be up shortly after 4:30 AM, so it is still dark outside when I get out of bed. Part of providing for my family is taking care of meals in the most efficient manner. Much of what I put into practice as a stay-at-home-mom carries over to now. I still menu plan for a month. I still buy meat when it is on sale. One thing I have added is that I try to use the crock-pot as much as possible. Since my husband works at home, I will prep as much as possible, then leave him a note with what still needs to be done while I am at work. This method has worked out very well for us. While I may not have considered buying a field, I knew time would quickly pass. My thirteen year old would turn sixteen in the blink of an eye, and want to drive. I began to save money, knowing we would need another car in just a few short years. When that time came, I was able to pay cash for a used car, avoiding debt. My daughter got the car that I had been driving previously. Because I had been at home for thirteen years prior to reentering the workforce, my heart was still at home. I have tried my best to be organized, running any errands after work, so that I not only save time, but also energy and gasoline. I will push myself to get things done on the days when I work so that when I have a day off, I can be at home. We see that she isn’t afraid of snow for her household because they are clothed with scarlet. One thing I do for the winter months is to make sure we are on the budget plan for our gas bill. This makes it easier for us in the bitter cold months to turn up the heat a bit, making all of us cozy, yet not breaking the budget in the process. Ladies, I know many of you don’t like the idea of working out or any type of exercise. For those of you who deal with monthly female issues, I want to tell you what I noticed. When I first started working out, those horrible monthly cramps dissipated! It was awesome! I could be at work, in so much pain, and think, “Oh, just get me home so I can exercise for twenty minutes!” Many times, the cramps were gone in less than twenty minutes. It really is worth the investment to do some type of physical exercise! And this advice comes from a woman who used to loathe the idea of exercising. Now it is a ‘high’ for me. It feels so good once I am finished. We see that the woman who fears the Lord shall be praised. My daughter has watched me over the years, and she often makes comments about what the Lord is doing in my life. There are no words to describe the feeling you get when your own child praises the work the Lord is doing in you. There is no joy like that of seeing your own child come to you for spiritual insight. She could go to her friends, but instead, she comes to you. What a blessing! We’ve all heard the parable of how the Good Samaritan was a good neighbor to the man who had been badly beaten. Several years ago, the question, “Who is my neighbor?” took on a whole new meaning for me. Rachel didn’t tell me what happened until we were driving home. She told me she felt like she was being mean if she didn’t let this older girl have the necklace. I immediately turned the car around and headed to the house where girl lived and I got her necklace back. On the way home, Rachel told me she was shocked when I did that for her. I used this situation as a learning tool, teaching her that she is not being mean by telling a person they can’t have something that belongs to her. We talked about how she will meet many manipulators in her lifetime. She needs to think about how to deal with them in a respectful, but firm, manner. A few years later, we were doing a mom and daughter bible study. One of the questions was, “Can you remember a time when your Mom went to bat for you?” With no hesitation, Rachel said, “When you got my necklace back for me!” Over two years had passed since this incident took place. Though she knew it was only a necklace, and she would be able to live without it, knowing that I cared enough to get it back for her spoke volumes to her. What a lesson it was on being a neighbor! Too often, we think of our neighbors as those outside our home. Sometimes they live under the same roof! I thought it was interesting to note that in the Greek, “without love” actually means to be without family love. We have sure seen an increase in this over the last few years. I remember the horror of hearing how Susan Smith had killed her two young sons by leaving them in the car, then letting the car roll into the water. Yet, there have been countless other stories in recent years of other parents killing their own children. There was also the highly profiled story of the Menendez brothers killing their parents. Yet, they weren’t the only ones who have done such an atrocious act. There have been countless others over the last few years. Doesn’t it sound like these families are “without family love”? I have a friend who used to work in a battered women’s shelter. She told me that the top three abusers are policemen, military men, and pastors. I have heard so many stories of youth pastors sexually abusing teenaged girls. That brings such pain, not to mention shame, to their families when it is exposed. It also causes a lifetime of pain for the young ladies who have been violated by a man whom they should have been able to trust. What about families who are too busy in outside activities to ever sit down to a meal together? What happened to family nights, where families would play games and enjoy each others company? Could it be that we have traded family love for outside activities? There are many families who leave the spiritual training of the children to a Sunday school teacher. That is contrary to scripture. Deuteronomy 6 makes it very clear that spiritual training is the job of the parents. In Proverbs, there are many verses that mention listening to your father and not forsaking the teaching of your mother. Again, it is clear that spiritual training is up to us, as parents, and not someone else. When we fail to be diligent to train our children in biblical principles, doesn’t that also show a lack of family love? We are all very busy, but we must constantly guard against becoming so inundated with activities that we fail to properly teach and train our children. We must be militant in keeping the family love alive, in both our marriages and in our parenting. God knows how impressionable our children are. That is why He told us to talk about His ways when we sit, walk, lie down at night, or rise in the morning. (Deuteronomy 6:7) Young children are like sponges, soaking up everything they see and hear. If our children observe us gossiping, what impressions are we leaving on their little hearts? Rather than gossiping, if we would turn to intercession, we would impress upon them that God is the first one to run to in a crisis. We will teach them to daily take their needs to the Lord. If we criticize the pastor, we impress on their heart that this man isn’t to be respected. On the other hand, if we talk excitedly about something we learned from the pastor’s message, we teach them that church is an exciting place to get new insights about our Father. If we speak critical words about the music they play at church or the songs they sing, we impress upon them to look for the negative. If we talk about how the music touched us and replaced our worry with God’s peace, we place an impression on them that could last for years. They will learn that godly music can be a healing balm to frazzled emotions. If we frequently act out of our feelings, rather than God’s truth, we place a strong impression on their hearts that will steer them to do the same thing. It could lead to years of living a very unstable life, being a constant slave to their emotions, rather than using God’s Word to master those runaway emotions. Yet when we speak forth God’s truth and stand on the Word no matter what our feelings tell us, their impression will likely lead them to stand firmly on the Rock. What impressions are you making in the hearts of your children? As mothers, don’t you sometimes wish that you could say, “I’m done!” It seems that a mother’s work is never done! Even when we are sleeping, we are still on-call for the one who may wake up ill during the night. We get the house cleaned, only to find that by the end of the day, the kids have trashed it once again! We can find ourselves falling into the mode of being ‘task-oriented,’ rather than ‘people-oriented.’ We can become easily irritated by any interruptions. We seem to forget that some things which happen are God-ordained; we view it as another interruption to our already busy schedule. In John 17:4, we find that Jesus is talking with the Father, saying that He has completed the work which God gave Him to do. I wonder how we might view each day, if we are careful to only do the things which Father really wants us to do. If He wants us to be diligently instructing our children in righteousness, will we be able to relax and let the housework go for a day? Would that cause excessive stress to our flesh because we have to view the messy house? Would we be able to set aside our plan to go to garage sales because someone is in need of a meal? Would we be able to put aside the plan we had made to do something refreshing in order to go visit someone who is in dire need of some company? Can we set aside our holiday tasks to play a game with the children, or read them a book? In Matt. 8:1, we find Jesus coming down from the mountainside, after having taught the people for many hours. He was probably hoping for some time of refreshing and relaxation. What did He find? He found that the crowds followed Him. Moms, do you ever find that your ‘crowds’ have followed you? Most of us can’t even go to the bathroom by ourselves! We can certainly understand the frustration that a person would feel when they can’t get away for that time of aloneness, that time to refresh oneself. But Jesus didn’t respond out of frustration to them. He continued to minister to them, putting His own fleshly wants aside. What a contrast between how the Master responded and how I often respond to those ‘interruptions.’ It’s quite convicting, to say the least. In verses 14-16, we find that Jesus was visiting Peter’s house. When we go to visit someone, it’s often to relax and fellowship. Yet, we see that Jesus is immediately called upon because Peter’s mother-in-law was sick. Not only that, while He was there, MANY were brought to Him. So much for relaxing and fellowshipping…..
As we move on to Matt. 8:23-25, we find that Jesus is trying to sleep, and now it’s the disciples who are ‘interrupting’ Him. Have you ever had those days when you finally get to climb into bed, hoping that you can find a peaceful night’s rest, only to find that just as you fall into a deep sleep, you hear these words, “Mom, I had a bad dream. Can I sleep with you?” Once again, a peaceful night’s rest seems to be out of the question. Moving on to Mt. 9:1-2, Jesus crosses over in a boat to visit His home town. Again, they bring people to Him. Those of us who have loved ones who live out of town know how precious those family times are. Yet, Jesus didn’t often have those times with His family because the crowds were always looking to find Him. In verse 27, He is still being followed. In verse 36, we find that as He sees the crowds, He has compassion on them. When we are followed by our ‘crowds,’ do we respond in the same manner? In my own life, I find myself falling short so many times when MY schedule is interrupted. 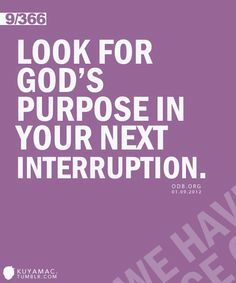 When I remember to view the ‘interruption’ as a God-given intervention, my attitude is quite different. Lord, help us to face each day, conscious of Your intervention in our lives. Help us to view interruptions as an ordained task, given by You. Help us to remember that as we serve others, we are really serving You. Help us to be able at the end of each day to say, “Father, I have completed the task that You gave me to do.” Amen.